IT costs, as we all know, represent a good portion of any company’s annual expenditures today. These almost overwhelming and recurring expenses must be continually monitored. Due to reader request for this chapter in electronic format, we are offering this as a Mini E-Book. It is an excerpt from "The IT Handbook for Business". Note: If you own "The IT Handbook for Business" you do not need this unless you want to have it additionally on an electronic device. This Mini E-Book is filled with cost saving measures that will make a huge difference in savings for a company or individual. 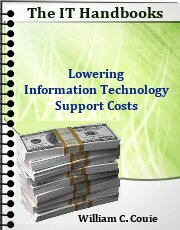 "Lowering Information Technology Support Costs" can help everyone learn what to look for and how to prevent waste without using technobabble to explain the information.